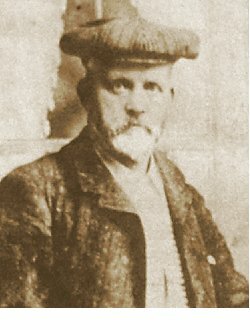 James Moffat was born in Wanlockhead, Dumfries, Scotland around 1839. By the time he was in his early 20s he had moved south and was living in Sherborne, Dorset. The 1861 census recorded him as an assistant draper and tea dealer, living and employed at fellow-Scots William Stewart's drapers at Green Hill, Sherborne. In the summer of 1869 at Axminster James married Emma Sellers, the daughter of Lyme Regis draper and hatter Richard Sellers and his wife Eliza. In the 1871 census James and Emma were living in High Street and James listed his occupation as a draper. Living with them were a draper's assistant and a general domestic servant. The 1881 census listed James and Emma at 5 High Street together with their five-year-old son Hubert John, a draper's assistant as well as a housekeeper and a general servant. James now listed his occupation as 'Sewing Machine Dealer & Fancy Draper' and in Whitby's 1882 Yeovil Almanack Advertiser he was listed as a sewing machine dealer. In the summer of 1887, at the age of 41, Emma died, most likely in childbirth since in the 1891 census James was listed as a 51-year old widower and was living above his shop in High Street with his Yeovil-born 5-year old son, Percy Wreford. James was listed as a 'Sewing Machine Dealer &C.' Also living on the premises were five young ladies listed as Assistant in Berlin Wools, Assistant in Ladies' Outfitting, Assistant Clerk, Assistant in Sewing Machines and a general domestic servant. In Whitby's 1895 Yeovil Almanack Advertiser James was listed as 'Sewing Machine Dealer, Prams, etc.' and it appears that the drapery side of the business was abandoned. The 1901 census listed James with his sons Hubert and Percy and two servants living above the shop. James listed his occupation as 'Sewing Machine & Cycle Dealer' and 26-year-old Hubert was listed as 'assistant to above'. By 1903 James was sharing the shop with Hubert. 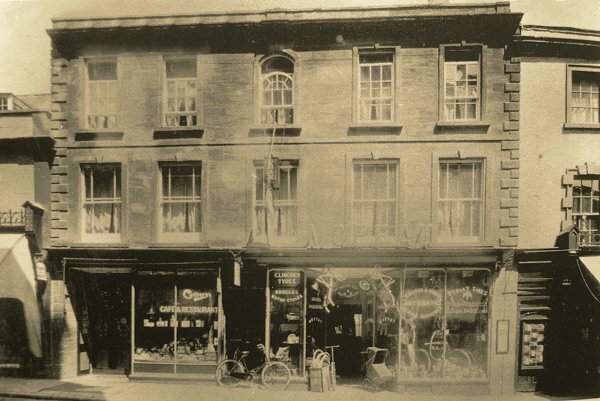 They tended to deal in different commodities in the same premises; James dealt primarily with the sewing machines while Hubert concentrated on bicycle sales. In Whitby's Yeovil Almanack Advertiser of 1907 James was advertising sewing machines and bicycles, but he had also expanded into selling mail carts, laundry appliances, motoring sundries and petrol. In the 1911 census James, now aged 71, described his occupation as 'Sewing Machine & Cycle Dealer' while both Hubert and Percy, now aged 36 and 25 respectively, were both listed as 'Assistant in the Business'. James retired around this time but died 29 March 1915. His will was proved that Taunton in the June in which he was listed as a 'retired sewing machine and cycle agent'. His sons, Hubert and Percy, were described as 'sewing machine, cycle and motor agents'. James' effects totalled £3,633 (just over £1 million at today's value). Hubert and Percy continued to run the High Street shop and even installed a petrol pump outside the shop to cash in on the motoring craze following the First World War. 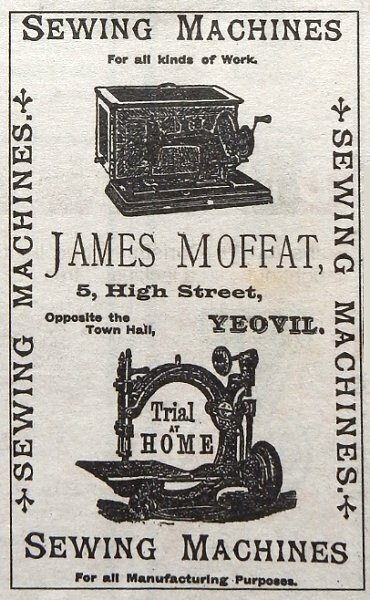 Nevertheless from 1919, in many local trade directories, Moffat's was only listed as a sewing machine dealer. Hubert Moffat died in 1944 aged 70 and Percy died in 1960 aged 74. After the brothers died, Moffat's was advertised as toy dealers in Foord's Directory of 1964. 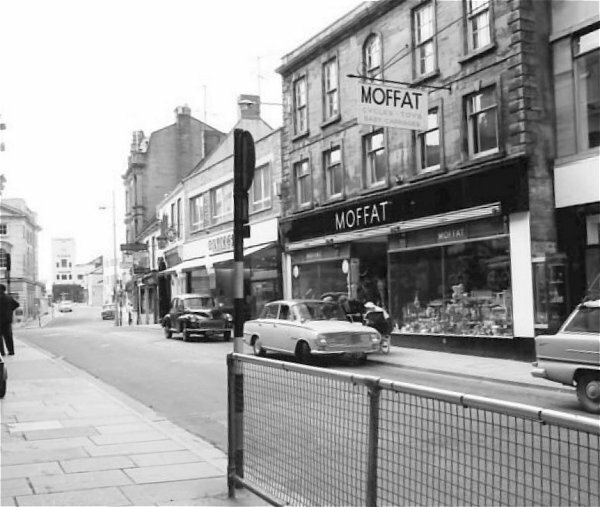 The Moffat premises in High Street finally closed in 1972. The building was demolished in 1974 but rebuilt in a very similar style. Today it is the premises of the Card Factory. Many thanks to Murray Love for forwarding the following letter that James Moffatt wrote to the Daily Telegraph in 1904. Whether you agree with his sentiments or not, I include it here to demonstrate that James Moffatt was an educated and erudite man. The son of a Free Church of Scotland elder and the brother of an Indian missionary, some thirty five years ago, when about the age of thirty, I eliminated, or tried hard to eradicate, from my mind, finally all cant and dogma and fear. During recent years I have adopted and adapted from various authors five portions, or sets, of ideas bearing on the mystery of things, the riddle of the universe. These may not be wholly true; they certainly do not wholly exhaust the truth; they are the best guesses at truth that I have met with. Modestly and with reverence I do not profess to know. I fearlessly think, and I honestly believe. Matter, substance cannot be destroyed or annihilated. Matter and force cannot exist apart. No matter without force, no force without matter. Matter and force are not two entities, they are two phases of one entity. They are two sides or two different manifestations of one reality. That which cannot be destroyed could not have been created. The indestructible is the uncreatable. Theory: Nothing has been, or can be, created. There never has been, or can be, a Creator. Matter and force are from eternity to eternity. They cannot be increased or diminished. Nature is the totality of everything there is. Everything that is, every being that is, is a fact in Nature. The supernatural does not and cannot exist. History disproves the alleged fall of man. Evolution substitutes for it the rise of man. Science has knocked the bottom out of Hell. Philosophy has killed the Devil. Reason and common sense, when freed from fear and prejudice, see in the Christian scheme of salvation only nonsense. The order and energy of the universe I hold to be inherent, not imposed from without. The human inhabitant of this world, humanity, is but a transitory phase of the evolution of an eternal substance - a particular phenomenal form of matter and energy; the true proportion of which we soon perceive when we set it on the background of infinite pace and eternal time. Where one world - say, our beautiful mother earth - is but as one grain of sand on the Portland to Abbotsbury pebble beach, or, more correctly, on a limitless shore, to what sufficiently insignificant is it possible to compare one life? One human life - one among 1,500 millions now alive. Before long Yeovil people will say of old Moffatt, "He has passed over to the majority." Think of that majority! Think of the innumerable myriads of human beings who have lived and are dead! I shall be there soon, and our mother's bosom will screen us all. The cypress waves, more holy than the palm." 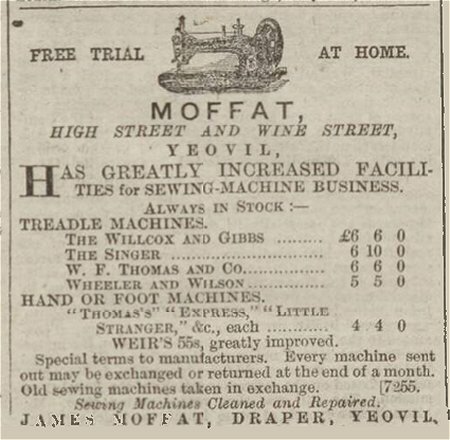 James Moffat's advertisement in the 16 May 1873 edition of the Western Gazette. Note that at this time Moffat had premises in both High Street and Wine Street. James Moffat's advertisement in the 1894 edition of Whitby's Yeovil Almanack Advertiser. 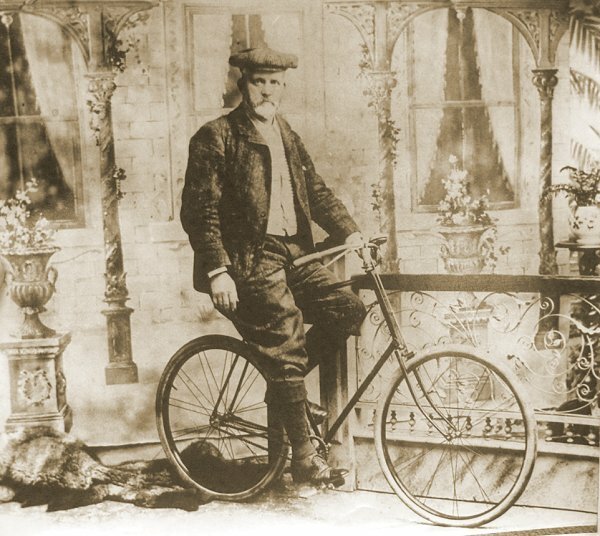 James Moffat, photographed around 1895 on a Lovelace bicycle made at Henstridge. 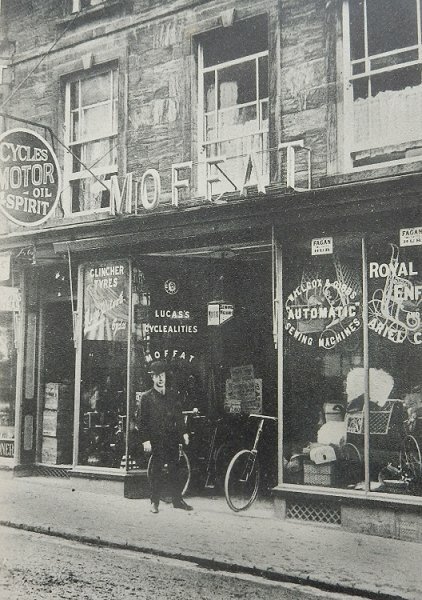 James Moffat's shop in High Street, photographed around 1900. The James Moffat's shop in High Street, photographed around 1905. Photograph taken from a postcard dated 21 October 1907 and used to deliver a note to a customer. 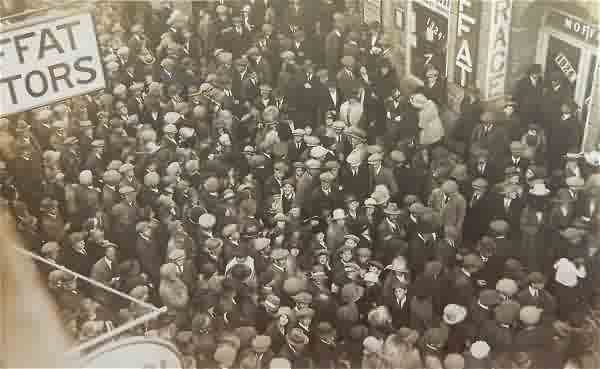 The crowd waits in High Street for the 1924 election results. At top right the Moffat Garage advertising is on a pillar of the Town Hall. 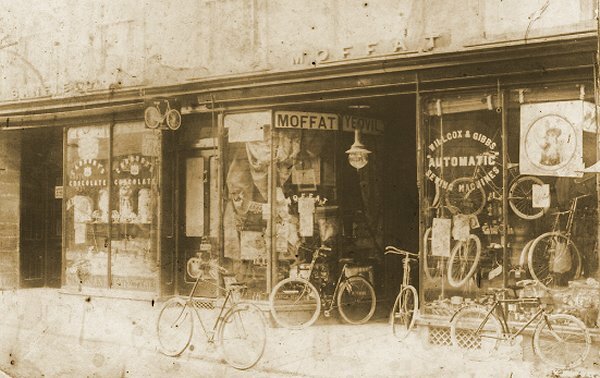 The sign of Moffat Motors at top left is on Moffat's shop opposite the Town Hall. 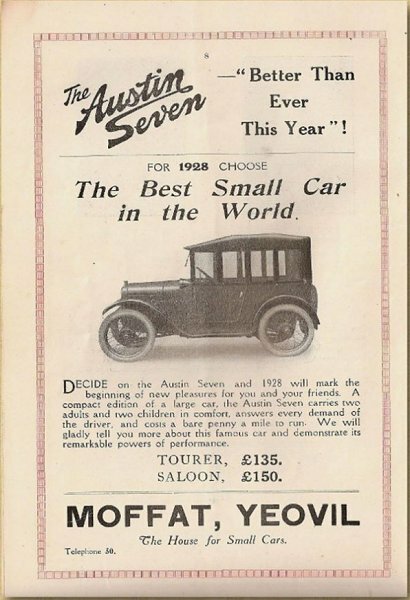 A 1928 advertisement by Moffat of Yeovil "The House for Small Cars". 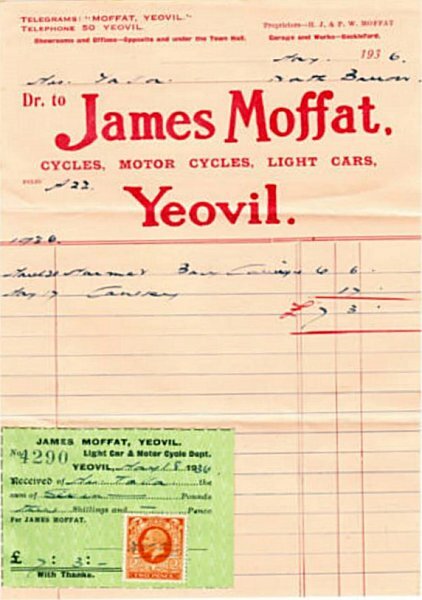 A 1936 invoice by which time Moffat's were clearly dealing in cars and motorcycles. 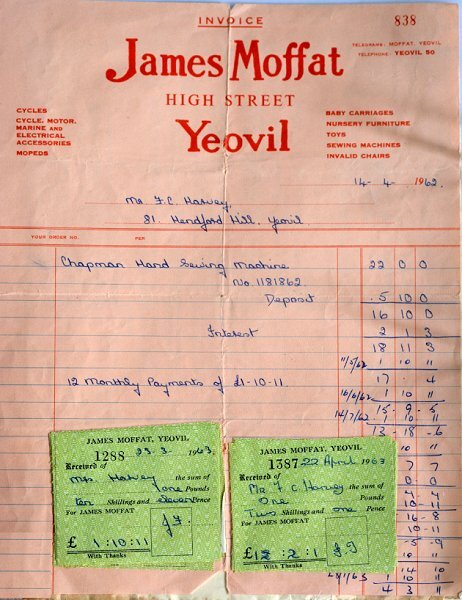 And another receipt (I've removed the name and address), this time for a sewing machine in 1962 with easy payments plus interest. By this time Moffat had stopped selling light cars but still carried an impressive range of items. 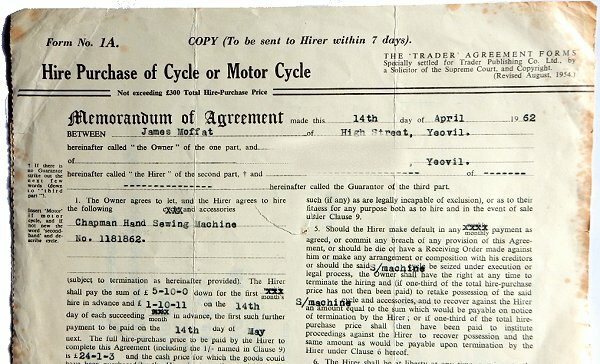 The HP Agreement (again with the name and address removed), dated 14 April 1962, for the sewing machine of the previous invoice. Moffat's advertisement in Foord's Directory of 1964-5. Moffat's advertisement in the 1967 Yeovil Guide. Notice the addition of the '58' prefix to the telephone number that hadn't been there in the previous advertisement of just a couple of years before. 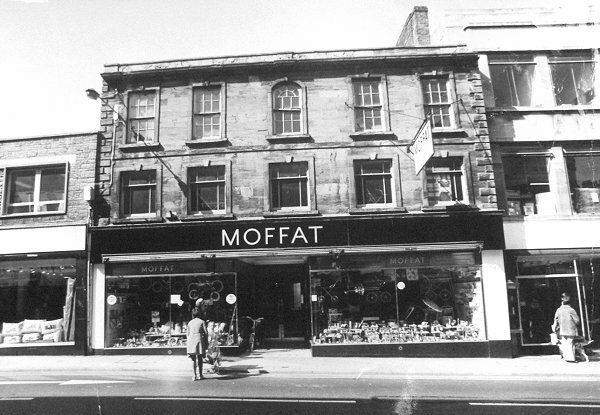 By the mid-1960's when this photograph was taken, Moffat's shop was sandwiched between the two parts of Gamis's store. .... and photographed around 1969.